Franklin Cultural District: FPAC presents Humbug! FPAC’s large-cast holiday musical, Humbug!, will be presented on Saturday, December 17 at 7:30 p.m. and Sunday, December 18 at 2 p.m. at the Franklin High School auditorium, located at 218 Oak Street. A family favorite since debuting as part of the company’s 2008 season, Humbug! 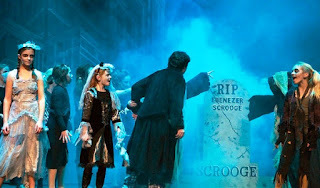 is an original musical adaptation of Charles Dickens’ A Christmas Carol. With music hits of every genre and live accompaniment by a 10-piece band of professional musicians, Humbug! transports audiences from Dickensian England to contemporary America as the novel’s iconic characters and storyline are cleverly reimagined with modern setting and dialogue. Humbug! stars the script’s writer, Nick Paone, as Ebenezer Scrooge. Founded in 1991, FPAC presents the holiday musicals as part of the company’s 26th season. With a focus on youth development and a commitment to live music, the nonprofit FPAC supports educational arts experiences, quality entertainment, and outstanding performance opportunities for professional artists, community performers, and students of the arts. Rockland Trust Charitable Foundation is FPAC’s 2016 Holiday Sponsor. For tickets and more information, visit www.FPAConline.com or call (508) 528-3370.